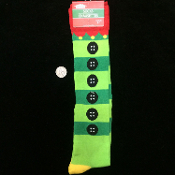 Adorable Dark and Lime Green striped stockings with faux black buttons and scalloped red top band. Fits adult women teen shoe sizes 4-10. 97% polyester, 3% spandex, exclusive of elastic.